Tips – Recommendations by Veterinarians. IRT does not endorse or recommend any specific type of diet as we are not pet nutrition experts. This is an example of a label (popular brand) listng ingredients that are unhealthy for your pet. 1. The first ingredient is CORN – GMO corn likely. Don’t know of too many dogs that go hunting for corn. 2. Soybean – another known GMO. 3. BHA – a preservative that is thought to promote cancer. That’s just a start. 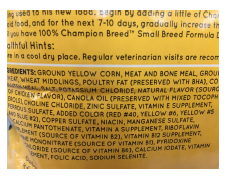 Wheat, corn syrup, food colorings – not fit for a pet’s nutrition. INGREDIENTS: Corn, soybean meal, beef & bone meal, ground wheat, animal fat (BHA used as preservative), corn syrup, water sufficient for processing, wheat middlings, animal digest (source of chicken flavor), propylene glycol, salt, hydrochloric acid, potassium chloride, caramel color, sorbic acid (used as a preservative), sodium carbonate, minerals (ferrous sulfate, zinc oxide, manganous oxide, copper sulfate, calcium iodate, sodium selenite), choline chloride, vitamins (vitamin E supplement, vitamin A supplement, niacin supplement, D-calcium pantothenate, riboflavin supplement, pyridoxine hydrochloride, thiamine mononitrate, vitamin D3 supplement, folic acid, biotin, vitamin B12 supplement), titanium dioxide (color), calcium sulfate, yellow 5, red 40, yellow 6, BHA (used as a preservative), DL-methionine. What is really in the food your dog or cat is eating? Your donation allows us to bring you vital information to help your pet live a long, happy, and healthier life. Thank you.